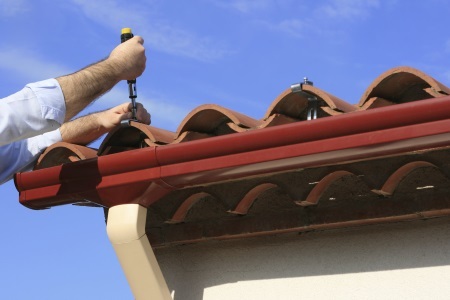 The professional roofers at M Roofing, LLC offer full service gutter installation and maintenance. A properly installed gutter system is an integral part of your roof. Without it, your home is at risk for water damage. M Roofing, LLC has been in the roofing business since 2000, providing professional gutter and downspout installation for residential customers. Call (832) 856-3853 for a no-cost gutter installation or gutter maintenance quote. Functional gutters that complement your home. M Roofing, LLC roofers have been installing gutters for more than 19 years for customers throughout the local area. Our professional roofers can help you choose a gutter product and color that provides functionality and style for your home. Call (832) 856-3853 for help choosing the right gutter product for your home. Gutters must be cleaned out several times a year in order to function properly. Otherwise, your home is at risk for water damage. Leaves, small twigs, acorns, and other debris can clog your gutter channels, preventing water from entering the downspouts. M Roofing, LLC can provide the right gutter maintenance solution for your home. Call (832) 856-3853 to speak with one of our gutter installation specialists. A gutter system helps protect your home from water damage. However, your gutter system can also be used to harvest rainwater for landscape water features, irrigation, toilet flushing, and other non-potable uses. Gutters can be used to capture rainwater and melted snow then store it in above or below ground tanks for later use. Reusing rainwater helps protect your landscaping when mandatory water bans are put in place. Call (832) 856-3853 to learn more about the environmental benefits of a rainwater harvesting system.